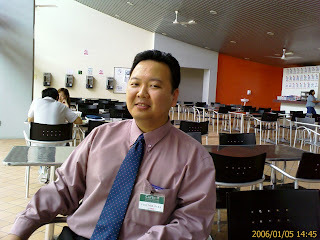 Photo was taken in Batam 2007..
For those whom doubt the authenticity, this photo was taken by ME! This picture was originally taken so as to show to friends whom have never been to that particular hotel in Batam looked like. It wasn't until in 2008 when organizing the photos that this phenomenon was noticed.. Spine chilling everytime I see this picture.. It's not everyday someone offers free money. He introduced me to a bank relationship manager whom offered a suite of credit cards that gives out free credit. A suite of 4 cards with first year subscription free and each comes with its own benefits and privileges. A up front of $95 free money. I lost a great friend yesterday.. He battled cancer for more than 18 months. I knew him as strong, intelligent and focused man with great ambitions.. Within a span of less than 2 years, cancer made him feeble and took away his dream, his strength, his ambition and his physique. When I knew him as a newly joined colleague, he was a new sales manager and he picked up a lot of engineering knowledge during his time with my current company. He possessed the passion and yearned to gain new knowledge. To the point that he, as a sales person, didn't need much technical help from the engineers when answering to customers about technical enquiries. As a friend, he never failed to call upon me whenever he is in town. Over Lunar New Year, if he was in Singapore, he'd visit my home or he'd call and ask if I'd like to hang out. Saturday evening, 18th July 2009, I received news from another pal of ours that he had passed away on that day at around 5pm. Sunday morning, I drove from Singapore to Malaysia to his hometown in Kluang, Johor to bid farewell to a great friend I respect very much. I had the chance to hang out with his loving family and shared my stories of him with them. You truly deserve your place on the web..
You will be always remembered and sorely missed..
Taken in Dec 2005 at Miri, Sarawak during his healthier days. F*ck you cancer for destroying dreams and taking away precious lives! It's a condition whereby an individual wants to have a fully-functional limb to be amputated to feel complete. This condition is also known as the "Body Integrity Identity Disorder". Elective amputation cannot be performed by any surgeons or doctors on such patients due to professional ethics. So these patients either self amputate (OUCH) or inflict irreversible damage to the limb such that doctors have no choice but to amputate it. There is a video here about one of these amputee wannabee. For those unfortunates, whom have lost a limb due to war, accidents or diseases, knowing that there are these group of elective amputee wannabees, I feel so sorry for the former. The only thing you can cut from my body is hair from the top of my head! Nothing much can be said about these spherical objects except they are perfect. At each 1 kg "exactly", they are smooth to near 0.0000000003 of a meter. 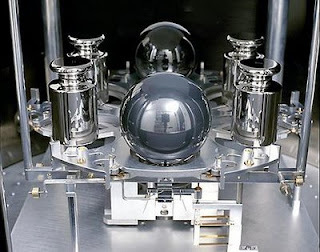 These silicone balls were made in Australia's Commonwealth Scientific and Industrial Research Organization aka CSIRO as they didn't want to depend on the International Prototype Kilogram of the le Système international d'unités. "Our balls are better than your balls, mate!" In the world of fashion today, it is normal for a woman to be dressed in a suit and pants. The opposite, however, proved to be a crime in Malaysia. It also carries a mandatory 14 day jail term if the RM25 fine was not paid. Changi Village will be a real money spinner for the local authorities. To all Scotsmen, don't wear your kilt in Malaysia. If you insist, make sure you have RM25 in where ever you choose to keep your loose change. A person is measured by his or her strength, achievements, credentials and academic references..
A smart person is defined by the IQ score. How then can you define a geek? Today, someone over at Wired.com listed 100 most essential skills a Geek should possess.. Some notable skills out of the 100 listed. For the full list of 100 geek determining criteria, head over to WIRED.com! Literacy is at its peak of human existence. The learning process repeats with each new generation. No enhancement can be made to inherit literacy or knowledge other than learning it the hard way from beginning (ABC). In human lifespan of 80 years, the first 30 is used to learn from scratch. It takes close to half the lifetime of the average human to be able to appreciate literature works. To be able to read and weep and be able to feel the thoughts of the author. To allow words to invoke our personal feelings. How can good literature works be produced when so much time is needed for learning literacy? Our fast moving environment and culture forces us to take the most direct and concentrated path to learn the skills needed for our own career such that the only text we choose to read are the ones that are informative and educational. And honestly, the bulk of it zooms down to either "business" related or "engineering" related. And if you are none of the 2, it's most likely that you'd fall either under "medicine" or "law". And in the business of literacy, most of these writers produce pop trash which in turn tries to make some business out of it. All these works are without much value of literature. There are genuine authors out there.. Not to make a living but to share their knowledge. Share their works of literature, in hope that their works can invoke the reader's feelings. To be able to share their emotions via words and text. Sadly, too little of such writers are in the modern world today. Unlike the old victorian days, where writers are highly sought and appreciated, today's writers produce stories in hope it becomes a movie script. Genes can be inherited and even cloned BUT knowledge can't. With each new generation, all begins from naught. To learn anything, one has got to learn how to read first. And that skill, might be the most daunting task for both the young student and the seasoned teacher. One whom can read, write and appreciate the language well, might not necessary mean that he or she can be able to teach or transfer the knowledge well.